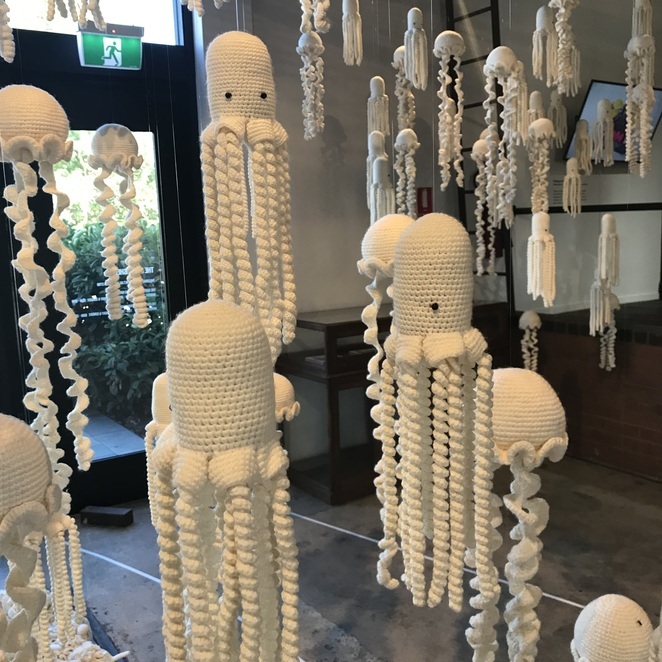 'A Man, A Monster & The Sea' is an underwater-themed art exhibit knitted and crocheted by Indonesian installation artist Mulyana that is currently showing for free at the Good Shed in Claremont until 7 June 2019. 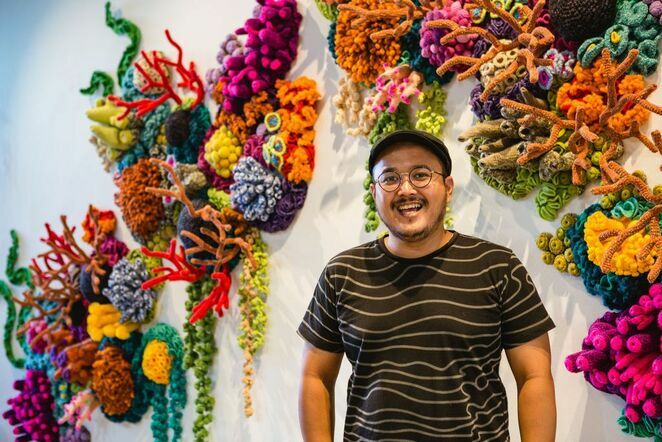 Mulyana is an Indonesian artist and art teacher from Yogyakarta, who got into crocheting as a form of meditation and as a way for him to explore his spirituality and his interest in art and nature. 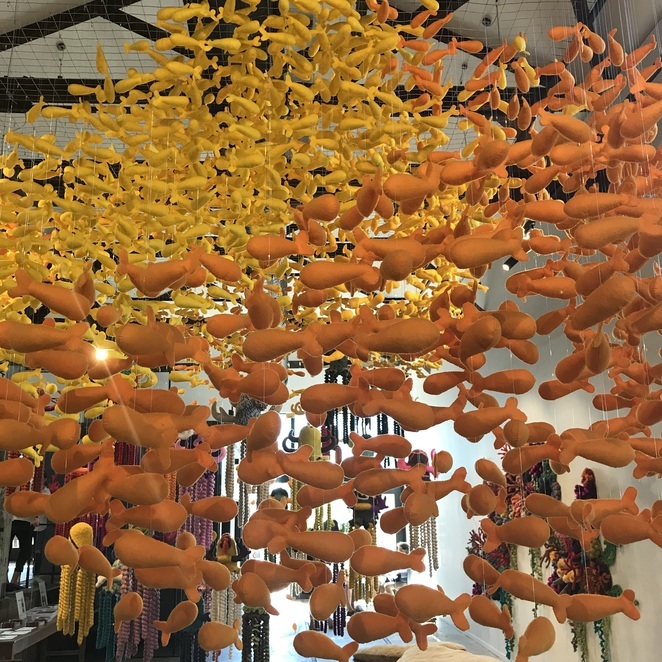 'A Man, A Monster & The Sea' is a cheerful and fun art exhibit that encourages people to think about the world that exists under the surface of the Indian ocean and to consider the impact that climate change is having on marine life. In 2008, Mulyana created an alter-ego character of himself that he called 'Mogus' (Monster). 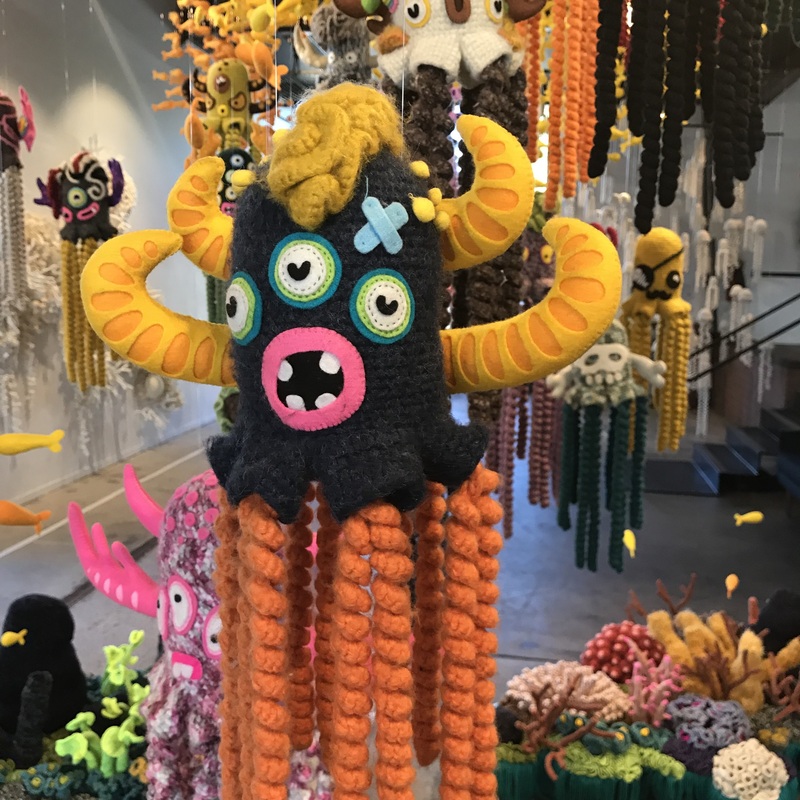 Mogus is described as a 'monster with multiple arms who is giving and generous to all people who are united through personal and global struggles'. 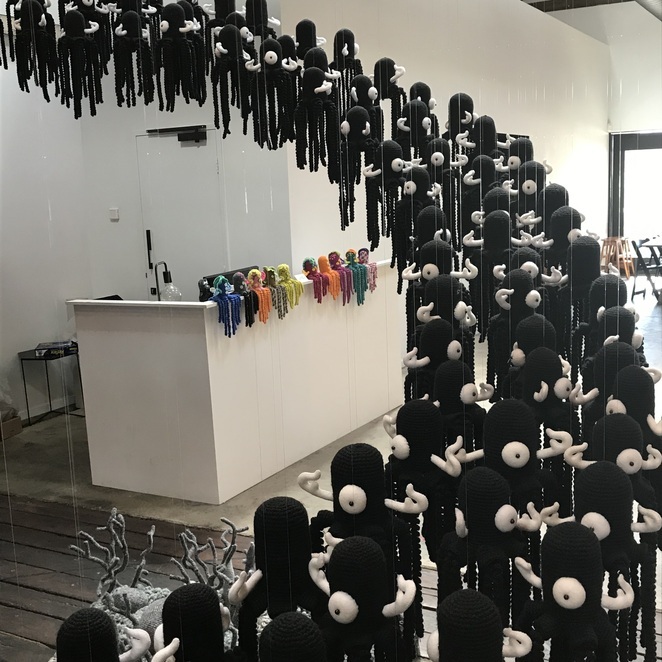 Mogus inspired Mulyana to create a world for himself where he could express his creativity and escape the bullying he experienced as a young boy. The first display in the exhibit, Mogus World IV, is truly stunning and is part of the Mogus narrative. It features colourful displays of realistic looking coral. The coral reefs represent the home of Mogus, which is depicted as a safe place where people can take refuge from the rest of the world. 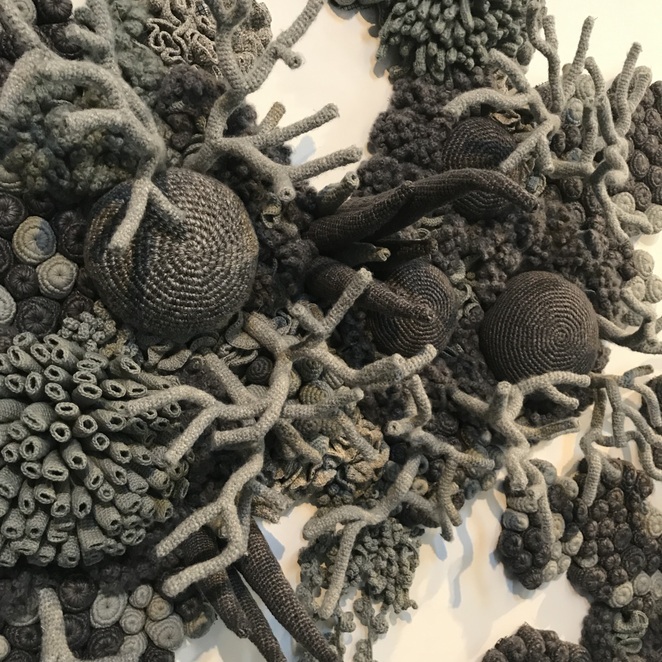 The corals represent the very human desire each of us has to find a place of beauty and comfort that will provide us with protection and shelter. The level of detail that Mulyana has put into the coral is very impressive. 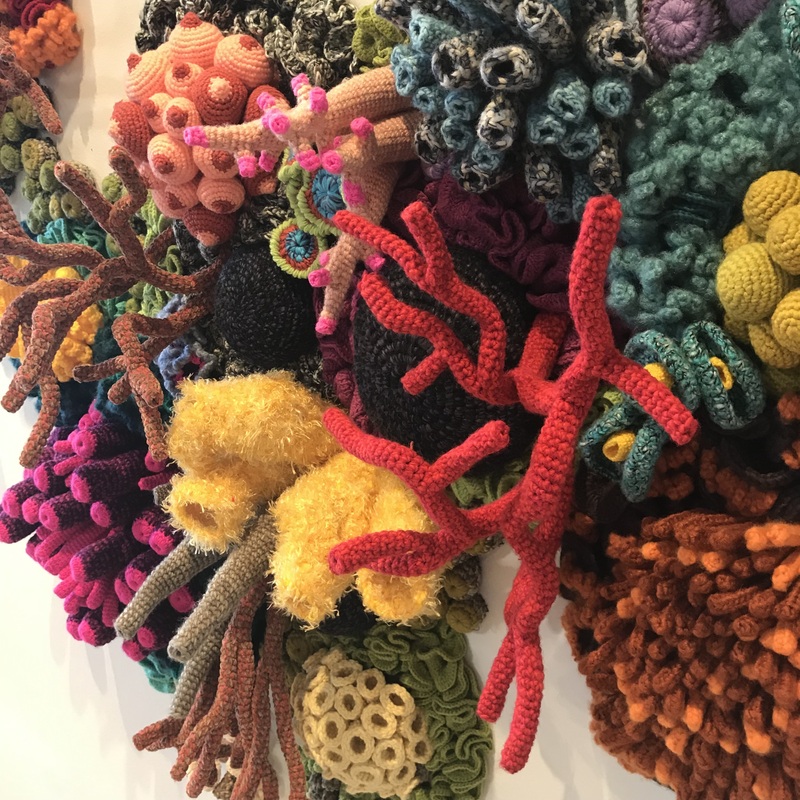 The colour and the diversity of the coral really makes you appreciate the beauty of the ocean and crocheting as an art form. What's really great about 'A Man, A Monster & The Sea' is how immersive it is. When you walk around the room looking at everything you really do feel like you are at the bottom of the ocean. 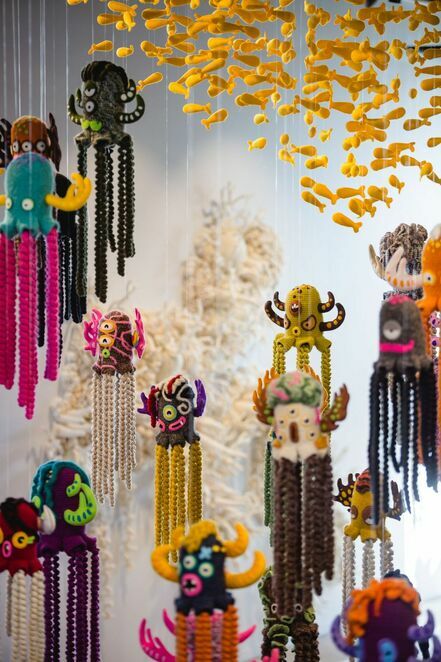 Hanging from the ceiling over the coral reefs in Mogus World IV are jellyfish with crazy faces and schools of yellow and goldfish suspended from lengths of string. I really liked how the fish were positioned in a way so that they looked like a cloud and how some of them were much lower to the ground than others giving the impression that they were swimming amongst the coral reefs. The jellyfish were also great. I loved how unique each of them were. They reminded me of characters that you might see in a Studio Ghibli film. After we finished looking at Mogus Island IV, we moved on to the next part of the exhibit which was called Satu. Satu was all about what happens to coral when it starts to die. 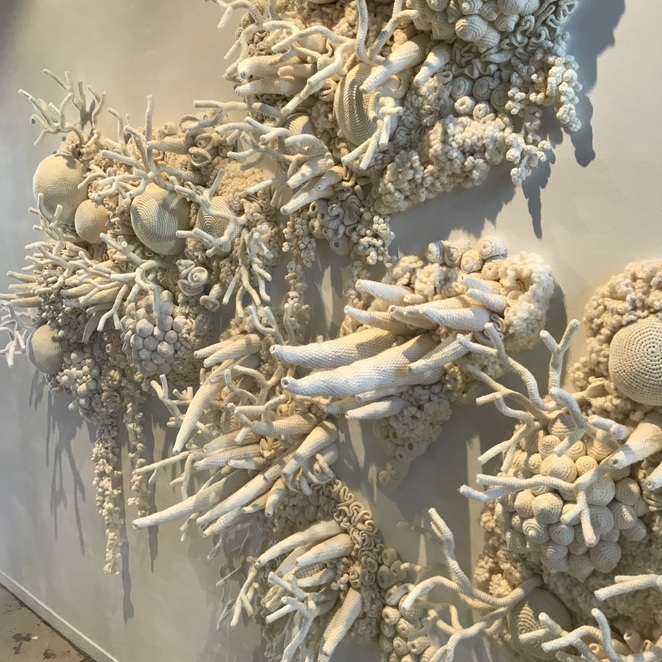 It featured sections of bone-white coral that had been bleached of all colour and a swarm of colourless and dead-eyed looking jellyfish hanging lifelessly from the ceiling. The purpose of Satu is to make people think about the impact that climate change and rising temperatures are having on the oceans. When coral gets stressed due to changes in its environment it starts to starve which causes it to lose its colour and turn white. Satu was designed to be the polar opposite of the vibrant and alive world of Mogus Island IV. It drove its point home really well. 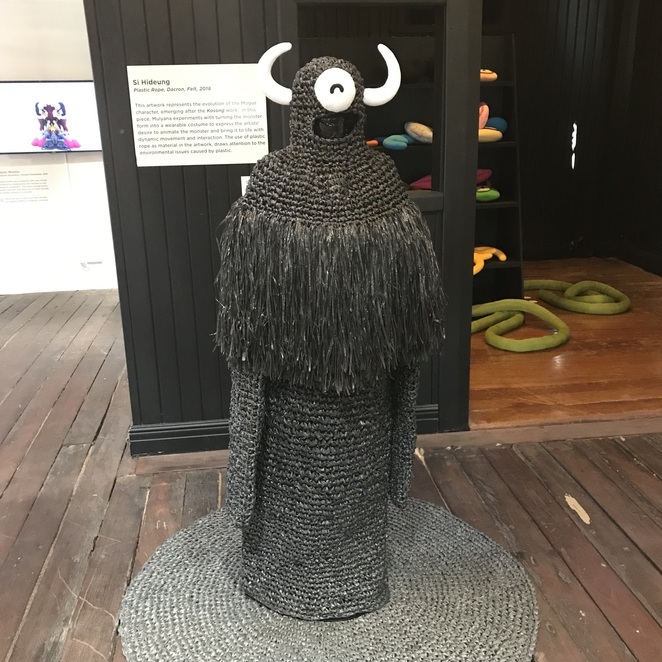 The next part of the installation featured a life-size and wearable costume of Mogus called Si Hideung. I liked how Mulyana incorporated strips of plastic rope into the piece to draw attention to the problem of plastic waste in the ocean. The last part of the exhibit was a piece called Kosong that made use of the colour black to symbolise that the character of Mogus was going through a change. The blackness is seen not as an empty void, but as a space to pause, before moving into the light to begin change. My favourite part of Kosong was the cluster of black sea creatures swarming over islands of grey coral. 'A Man, A Monster & The Sea' was an absolute delight. If you would like to come down and see it the Good Shed is open from 8am to 3pm on weekdays and from 9am to 3pm on the weekend. The exhibit is scheduled to become part of the Scribblers Festival which will run from the 8th to the 12th of May 2019. For more information about the Scribblers Festival click here. Why? A Man, A Monster & The Sea is a one of a kind art exhibit featuring a colourful display of corals and fish and other reef species painstakingly knitted and crocheted by Indonesian installation artist Mulyana. When: 14 March 2019 to 7 June 2019. The Good Shed is open from 8am to 3pm on weekdays and from 9am to 3pm on weekends. The knitted coral looks incredible.